Institutional capacity for macro-regional cooperation. Climate change is covered under priority 2, which includes four objectives: (a) water management for reduced nutrient inflows and decreased discharges of hazardous substances to the Baltic Sea and the regional waters (objective 2.1); (b) increase production and use of sustainable renewable energy (objective 2.2); (c) increase energy efficiency (objective 2.3), and (d) advance sustainable and resource-efficient blue growth (specific objective 2.4). The programme also has a number of horizontal principles including one related to adaptation - sustainable development. The EU Strategy for the Baltic Sea Region aims to reinforce cooperation within the Baltic Sea region to promote a more balanced development in the area, to contribute to major EU policies and to reinforce integration within the region. Climate change was a priority since the very first Action Plan of the EUSBSR in 2009, when the EUSBSR called for the development of a macro-regional approach for adaptation to climate change. In 2013–2014, climate change was incorporated in the Horizontal Action ‘Sustainable Development’, and the Horizontal Action Climate of the EU Strategy for the Baltic Sea Region (HA Climate of EUSBSR) was introduced in the 2015 revised version of the EUSBSR Action Plan. Achievements so far have targeted environmental challenges in the region, especially connected to the reduction of nutrient loads and the increase of water quality, and succeeded in setting up activities including all EUSBSR countries. These activities, aiming at the improvement of the environmental status, will generate indirect benefits under changing climate conditions as eutrophication will generate higher negative impacts with increasing temperatures. The countries part of the region are, except from Norway and Belarus, also contracting parties of the Helsinki Convention, which is the ‘Convention on the Protection of the Marine Environment of the Baltic Sea Area’. The convention aims to protect the marine environment of the Baltic Sea from all sources of pollution through intergovernmental cooperation and covers the whole Baltic Sea area, including inland waters, the water of the sea itself and the seabed. The convention is governed by the Baltic Marine Environment Protection Commission (HELCOM), which has a number of initiatives related to climate change adaptation (CCA), e.g. 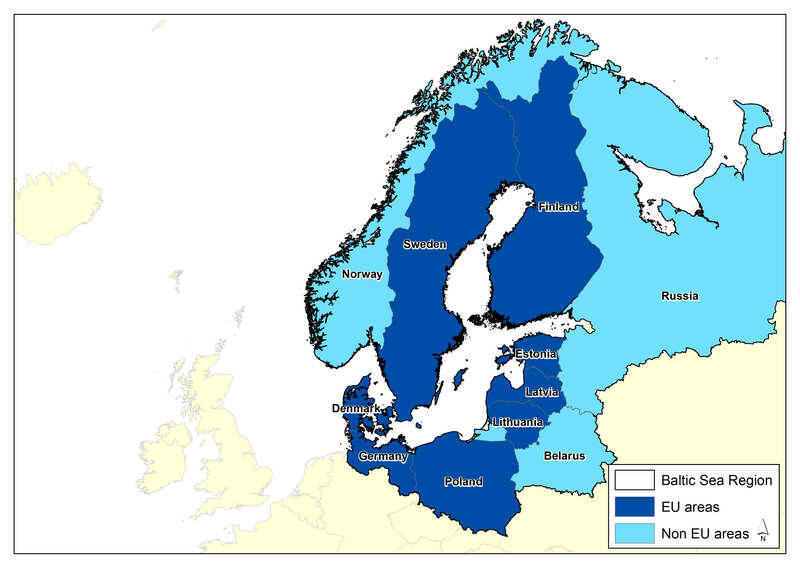 regular regional assessment of climate change and its implications for the Baltic Sea. The Council of the Baltic Sea States (CBSS) is a political forum for intergovernmental cooperation in the Baltic Sea region. Founded in 1992, it aimed in a first instance at supporting the transition of the Baltic Sea region into the new international landscape after the end of the cold war. Its current mission is supporting “a global perspective on regional problems”, which includes the translation of international treaties as, among others, the UN Sustainable Development Goals, the Paris Climate Agreement, and the Sendai Framework on Disaster Risk Reduction, further to the EUSBSR strategy (8 of the 11 Member States of the CBSS are also Members of the EUSBSR strategy) into regional actions on the ground. The CBSS leads the Horizontal Action Climate of the EU Strategy for the Baltic Sea Region and has initiated the BSR Climate Dialogue Platform. This Horizontal Action also aims at evaluating the success of adaptation policies implemented by Member States and improving coordination and synergy among BSR initiatives and projects dealing with adaptation. The UBC (Union of the Baltic Cities) Sustainable Cities Commission is active through its policy areas focusing on climate change, including adaptation, which aims to strengthen the local levels through cooperation and networking. The Baltadapt project, which had been financed under the INTERREG IV B Baltic Sea Programme 2007-2013, produced an adaptation strategy for the Region, which is accompanied by guidelines and a non-binding action plan. The 2014 CBSS high level political meeting endorsed the adaptation strategy in the document ‘Decision by the Council of the Baltic Sea States on a review of the CBSS long term priorities’. The Baltadapt Strategy for Adaptation to Climate Change for the Baltic Sea Region is one of the few examples of transnational adaptation strategies in Europe. The strategy intends to complement national and sub-national adaptation processes in the Baltic Sea region, in particular by improving coordination across levels and sectors by means of information sharing and development of networks. The Baltadapt strategy has been integrated into the EUSBSR strategy, in particular through the EUSBSR Horizontal Action on Climate, which aims at increasing awareness and capacity for climate change adaptation in the region, focusing in particular on the local and regional level. The CBSS has established the BSR Climate Dialogue Platform, which aims at making regionally specific climate adaptation materials publicly available through the Climate-ADAPT platform and at developing a joint capacity training and awareness raising project. The BSR Climate Dialogue platform has been endorsed by the CBSS Foreign Ministers and holds regular meetings of representatives of national governments, the EC and BSR flagship projects to discuss the progress of implementation of the EUSBSR HA Climate and the BSR adaptation strategy. Up to June 2018, none of the projects approved by the Baltic Sea Region INTERREG V B Baltic Sea Programme 2014-2020 seems to directly address climate change adaptation related challenges. However, the INTERREG V A Central Baltic Programme 2014-2020, which includes a significant portion of Central Baltic in its cooperation area (consisting of parts of Finland, Sweden, Estonia and Latvia), has funded the EUSBSR flagship project iWater (Integrated Storm Water Management), which ran from 2015 to 2018. While previous projects implemented in the framework of the INTERREG IV B Baltic Sea Programme 2007-2013 (e.g. BaltCICA, Baltadapt, or BalticClimate) had a cross-sector approach to climate change adaptation, iWater had a sectoral emphasis on water management. In particular, it aimed to improve urban planning practices in the cities of the Baltic Sea region through the development of an integrated storm water management system. The project partner cities and municipalities (Riga and Jelgava in Latvia, Söderhamn and Gävle in Sweden, Tartu in Estonia, Helsinki and Turku in Finland) adopted new programmes and tools that were eventually integrated into urban planning processes. Using these pilot sites as examples, transferable guidelines and tools were developed in the partnering cities with the involvement of local stakeholder and interest groups. Approximately 35 other Baltic Sea cities were trained to use developed methods in the region. Detailed information including links to the most relevant documents on adaptation in the Baltic Sea Region is provided by the Baltic Sea Region (BSR) Climate Dialogue Platform.